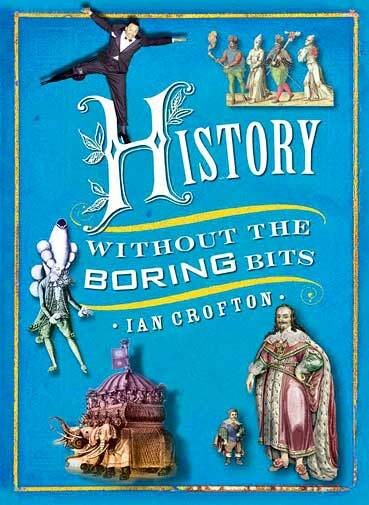 History Without the Boring Bits /by Ian Crofton. Conventional chronologies of world history concentrate on the reigns of kings and queens, the dates of battles and treaties, the publication dates of great books, the completion of famous buildings, the deaths of iconic figures, and the years of major discoveries. But there are other more interesting stories to tell - stories that don't usually get into the history books, but which can nevertheless bring the past vividly and excitingly to life. Imagine a history lesson that spares you the details of such seminal events as the 11th-century papal-imperial conflict, that fails to say much at all about the 1815 Congress of Vienna - and that neglects entirely to mention the world-changing moment that was the 1521 Diet of Worms. Imagine instead a book that tells you the date of the ancient Roman law that made it legal to break wind at banquets; the name of the defunct medieval pope whose putrefying corpse was subjected to the humiliation of a trial before a court of law; the identity of the priapic monarch who sired more bastards than any other king of England; and last but not least the date of the demise in London of the first goat to have circumnavigated the globe - twice. Imagine a book crammed with such deliciously disposable information, and you have History without the Boring Bits. By turns bizarre, surprising, trivial, and enlightening, History without the Boring Bits offers rich pickings for the browser, and entertainment and inspiration aplenty for those who have grown weary of more conventional works of history.